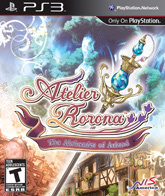 Atelier Rorona™: The Alchemist of Arland | NIS America, Inc. The Atelier Series finally makes its debut on the PS3! Guide Rorona through her struggle to keep her alchemy workshop open. Make new friends, earn the trust of the townspeople, and uncover the mysteries of alchemy. With over 30 different endings, this beautifully cel-shaded RPG adventure never ends! © GUST CO., LTD. 2009/2010. All rights reserved. Licensed to and Published by NIS America, Inc. Atelier Rorona is a trademark of GUST CO., LTD.